It's Bonus Ticket Friday here at Vintage Disneyland Tickets! A couple of gems for today's short but sweet post. First, expiring June 15, 1957, these are "Special Bonus Tickets" This have no perforation on either side so they did not come from a booklet. I am not sure how these were given out, I'm guessing they came with the "tour" package or some other promotional deal. Update: From Progressland: According to my sources, the Big 10+2 Winter Bonus Ticket Plan started January 19, 1957 and ran through May 12, 1957. (It must not have worked out as well as they had hoped as they extended it from a March ending.) You Get ADMISSION, 10 fabulous RIDES plus 2 bonus rides of your choice! You SAVE up to 34% over single priced admissions PLUS up to $1.00 in Extra Bonus Rides. The back is pretty darn simple. Basic "Courier 10" font and a little sloppy. That's not dirt or grease, that original ink smeared on the back. You don't see blemished Disneyland ticket like that very often. 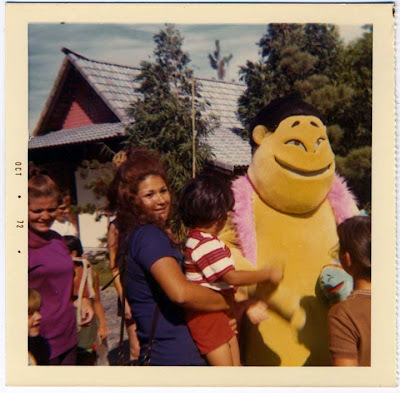 From Major at Gorilla's Don't Blog (I'm going to owe him some residuals soon!) 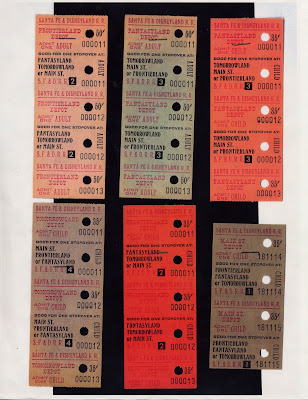 a neat set of Bonus Tickets that expire May 31, 1958. 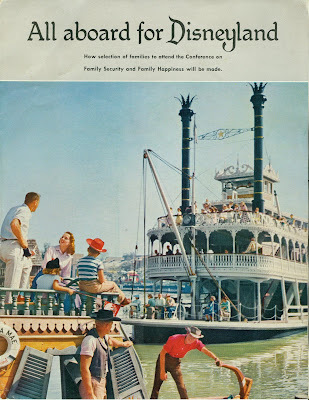 Check out the stereotypical picture of a 1950's family on each ticket. This does appear to have a perforation on the left side so maybe it came from a special ticket book. Even though these Bonus Tickets are not indicated as "special" they sure look special to me. Thanks Major! Update: From Progressland: Bonus Time at Disneyland ran from January 18, 1958 through April 6, 1958. 2 Free rides of your choice with every ticket book! Here's the hook: "If you buy 4 Big 10 or Jumbo 15 ticket books for your family, you'll get 8 additional bonus rides at no extra cost. That's an actual $4.00 bonus value! Yes, you get two big bonus rides of your choice with every Big 10 or Jumbo 15 ticket book! And it's available now!" As my regular readers know, I can't have a post without some color. 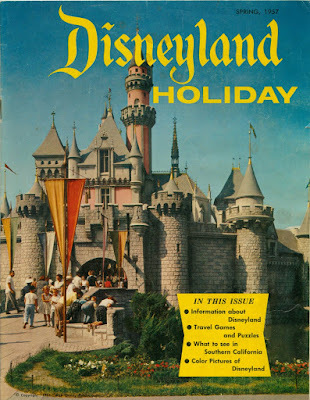 From Spring 1957 here is the cover of "Disneyland Holiday" Gotta love that 12 cents a foot wire fence protecting the grass (and dirt). Check back Sunday, this entire magazine might surface. Thanks for the great information Progressland! 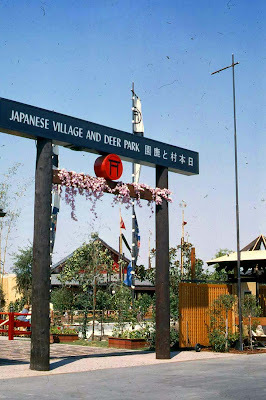 Japanese Village & Deer Park - 100th Post! I just noticed this is my 100th post! WOW, that went fast! 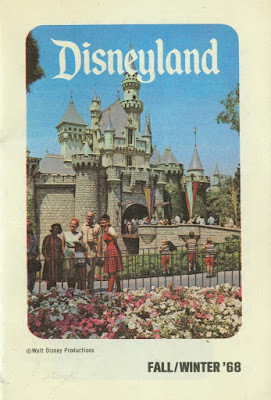 Had I noticed sooner I might have done a Disneyland Post, I'll make up for it tomorrow. For some great Pictures of the place, try these two GREAT Blogs! Here is a neat little Courtesy Pass. It's not dated, so a guess would be 1969/70. 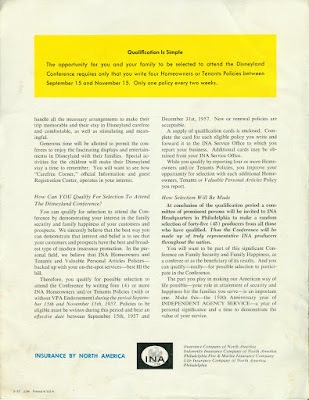 Here is a Guide from 1969. I had a heck of a time with the Map part, I could not get it to post as normal size. I'll try to fix it later. Also from "Stuff From the Park", These are the "Fuji Folk" guys that hung around the park. 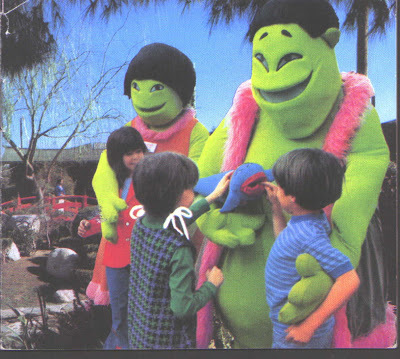 These Gargantuan Muppet's from an alternate universe scare me. 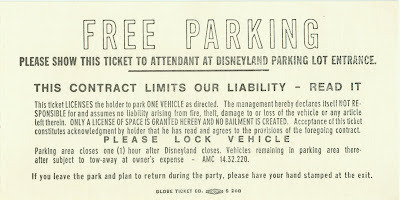 Tomorrow it's 1950's Disneyland Special Ticket day. Taking a look back to my "D" Ticket post (link), here is a 1956 "D" Ticket showing the two trains and there two related stations. Main Street's "SF&D Passenger Train" and Frontierland's "SF&D Freight Train" (scan courtesy of www. keeline.com). 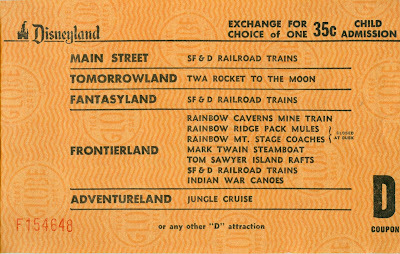 This "D" Ticket is from Late 1957 and shows three stations now, but the trains are all called "SF & D Railroad Trains". No more Freight Trains and no more "round trip only". Now you can exit or enter at any station, that makes a lot more sense. The next three images were most graciously donated by Major over at "Gorilla's Don't Blog" THESE ARE INCREDIBLE - THANK YOU MAJOR! I believe these are from 1957. These are the Individual tickets you would purchase at the Train Stations. Could you use these until the stubs where gone? Thereby letting you board at all three stations. Does that seem right? It's the same price as one "D" ticket. 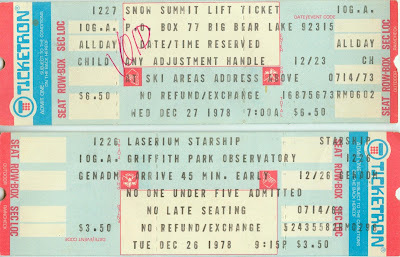 On Monday's post, that long ticket was only good once. But these do say "Good for one Stop Over at". What is this one all about? 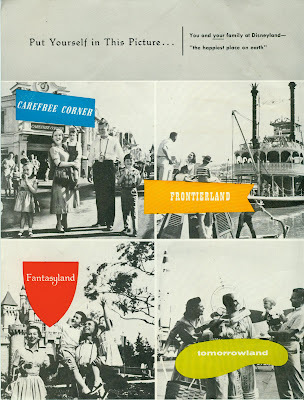 Fantastyland to Main Street 25 cents? This has to be VERY rare, I didn't even know such a thing existed. How did they enforce this? Did they used to check everyone's ticket on board? Did everyone exit at the Main Street Station? Thanks again for the scan Major, these are great! Back to my "Conductor's checkless" collection, here is a Child's Train ticket. When the conductor took his "check" he would stamp the back like this. 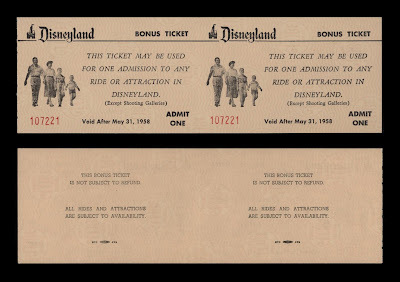 This Late 1958 "D" Ticket now has the new Tomorrowland Station. (scan courtesy of www. keeline.com). By late 1958 they stopped the large stylized individual tickets shown above. The little tickets seem to have taken there place. Shown below are samples of the "stub" style tickets. These are individualize for each of the four stations, and allowing you one stop-over at any other station. What do they mean by "stop over"? These are also the same price as the "D" ticket and that's only good once, so where these only good once also? This hurts my brain! This just in. Sent to me by a reader (actually the seller of the Green Press Ticket, it sold for $1000 by the way, congratulations to the seller!) This is the same 1955 Yellow ticket I posted Monday, except this one has the Conductors Check! Thanks for donating this scan. 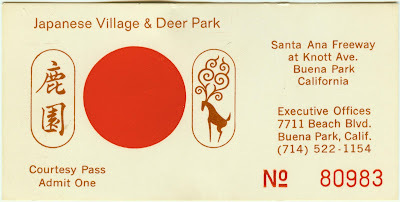 Tomorrow we head east to Knott Avenue, but it wont be to the Berry Farm, we're heading to the Village (and Park). Warm up the time machine and set it for February 26, 1977 because we are going to "A Private Party at Disneyland"! Yes it's the Sears Family Fun Party - Saturday Nite 8:30pm to 1:30am! What, you don't work at Sears? Well it just so happens I did! Yup, Sears was my first real job, employee number 2519 (why do I still remember that?) Anyway, we'll pretend you're part of my family and therefore part of the Sears Family, so you can come along. Free Parking too! I'll drive my 67' Olds Toronado, it seats six no problem! I am sure you are wondering what I did at Sears? (probably not, but I'm gonna tell ya anyway). I was hired at the "Customer Convenience Center" but I quickly got promoted to work the Ticketron Machine. That was a blast, and it made me suddenly VERY popular in High School (psssst, need Journey or Styx Tickets?). I still have a couple of "Voids" I saved. These are from when you loaded the tickets backwards or misaligned them. Snow Summit all day for $6.50! Ah the Laserium for $3.50. Starship, hey I went that one! And from my donated copies of a ticket binder that I believe still remains at Disneyland, here is a printed Ticketron Disneyland ticket from December 31, 1981. 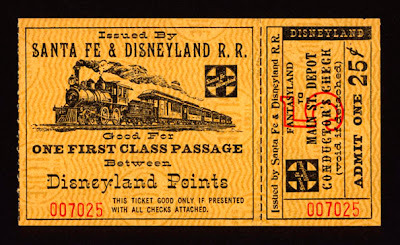 In today’s post we take our first look at Disneyland’s Railroad Tickets. As you may know, for the first couple of years Disneyland had two separate train attractions, one at each of its two stations. Main Street Station had what was once called the “Santa Fe and Disneyland Limited”. You boarded windowed, indoor style cars “for one first class passage” and you took a round trip circle tour with no stops. If the “Freight” train was stopped at the Frontierland Station, the Limited used a parallel set of tracks as a “passing siding” and passed right on by. Same deal at the Main Street Station. How cool would that have been to see in person! Here is the same type of ticket but in grey. The print is the same as the yellow one so I have no idea why there was a different color? Maybe it represents “child” or “adult” or maybe they just ran out of the other color? I posted this one vertical so you can read the little stubs, they are so cute! This ticket is 11” long; Knott’s had huge train tickets too! Did real train tickets used to be a foot long? This image is borrowed from Miceage, this ticket is for the “Western Route”. “Frontierland Freight good for freight or cattle passage”. 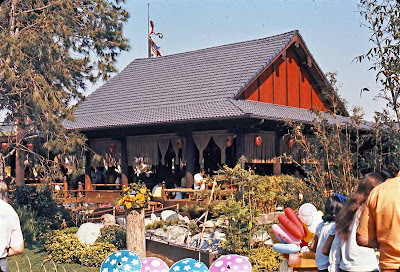 This was for the train from Frontierland Station which originally had true “standing room only” cattle cars. These were soon converted to open side cars with bench seating. (I think they still have these cars and they drag them out every once in a while). The stub does more or less indicate this is a round trip with no stops. In the next installment of this series we will take a look at the tickets that followed these as a third station was added and the “Passing Siding” was eliminated. Check for part two on Wednesday, tomorrow we are having a “Private Party” at Disneyland! This weekends full guide post is the Fall/Winter 1968 edition. It covers November 1, 1968 thru January 15, 1969. 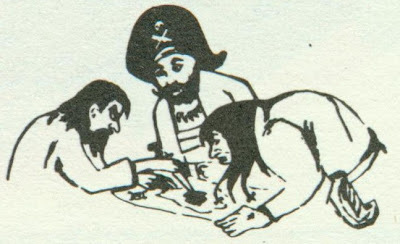 This and a few other same era editions of the guide book have each land without a map, just text and a couple pictures. 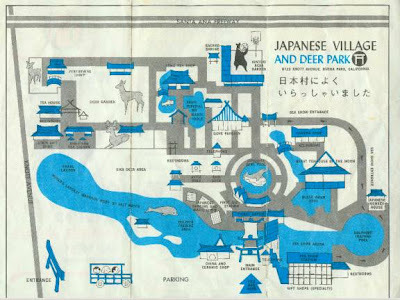 This didn't last long and the individual realm maps with there attraction locations returned in 1970 and stayed for two decades. I love this artwork!!!! Look for it starting on page 5. 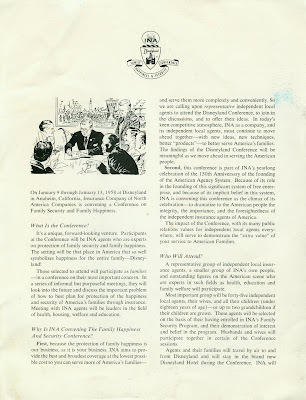 “How selection of families to attend the Conference on Family Security and Family Happiness will be made”. It appears to be for INA insurance agents, sell a few policies go to Disneyland! Fun reading! A chance to stay at the "New Disneyland Hotel". A little update on today's Magic Mountain post. Major, yes I rode it backwards, that was nutty and forwards before they "fixed" it was crazy fun as well. I still ride Goldrusher at least once each visit and it still gives me the biggest smile. Good MM ephemera is scarce. I do have a decent collection however, you haven't seen it all yet! Viewliner, I'm glad these bring back memories, they sure do for me. Here are the cars at the maintenance building with Flashback shown for reference. The main Metro station is in the lower left hand side of the photo. Here is a close up of the cars. They sure look fine to me, I believe they are fiberglass. They used to be solid colors, I'm not sure when they changed. The People Mover did a similar color change in the 1980's. And this is the exit cue for the Main Metro Station, just waiting to be used. Six Flags Over Georgia has the exact same Monorail system (actually a few years older than Magic Mountains, but the same thing) and it's still running! I imagine they fabricate the parts they need. These systems are not that complicated. They don't have any side "banking" to worry about and they were fully automatic in 1971 (a new car every two minutes) so how complex of a ride system is needed? Can you tell I am passionate about the Metro? I once rode it once for 2 hours straight, round and round the park. I'd do it again in a heart beat! 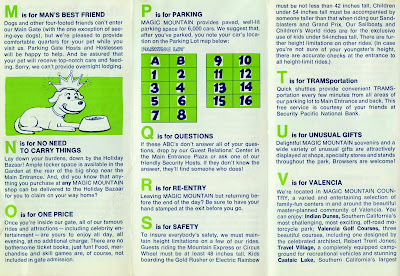 “Our ABC’s” From Magic Mountain. 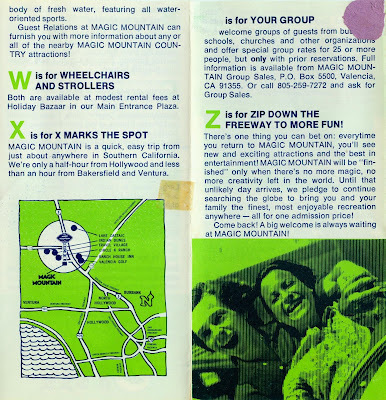 This undated brochure from Magic Mountain is from the early 1970’s. 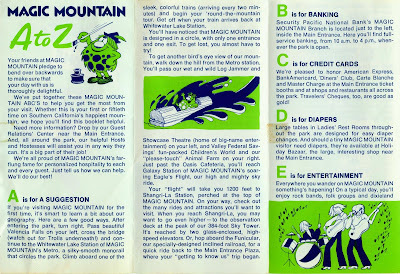 I believe the “ABC’s” comment is a direct poke at Disneyland’s ticket book plan. 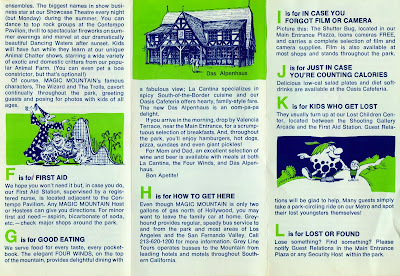 Disneyland even had the little handouts about the tickets that were titled “The ABC’s of ticket books”. This was Magic Mountains way of saying “look what one price gets you” (“o” is for one price). First up of course you must park you car (“p” is for parking”). So here is your parking ticket, 75 cents! Hey it’s only $15 to park there now, WHAT? And here is the entire little brochure. I love the trolls and they are sprinkled throughout. Wow, someone likes lime green! 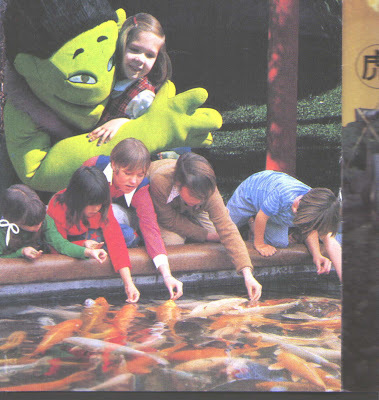 And since there is not much color in this brochure, here are a few post cards from the early days, boy do I remember it like this. 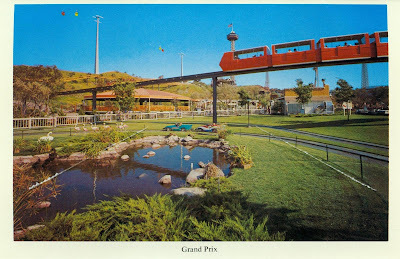 The Grand Prix (autopia with a smaller track) and my beloved Metro. Don’t even get me started on the Metro Monorail. It’s all still there, the stations, the tracks, the cars. REOPEN IT Six Flags! Ah Eagles Fright, I mean Flight. That thing scared the living daylights out of me. My friends would try to rock the cage at 200+ feet in the air. 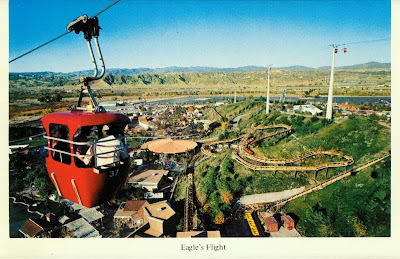 This was the only time I actually threatened to strangle someone, they stopped – I never rode it again. And the Mountain Express. Currently Flashback is on this same site. 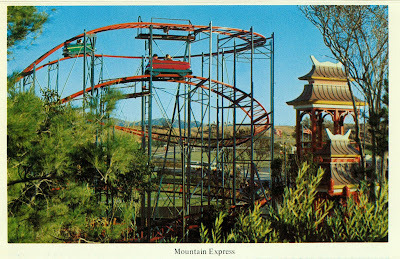 Having ridden both, I can attest that the Mountain Express was a much better ride. I believe Flashback is still there, rotting and rusting away. I read somewhere that the Mountain Express was sold and is still in use, but I don't know where. I hope you enjoyed a retro look at the Mountain! Guided Tour - Part 2 197?